Faced with the choice to get rich or do the right thing, it takes strength and genuine courage to sacrifice wealth and help others. Three Kings presents this choice, with strong geopolitical consequences, in a fictional story inspired by the war to liberate Kuwait in the early 1990s. The 1991 war to kick the Iraqi army out of Kuwait has started and ended with lighting speed: most of the American soldiers stationed in the desert saw little action. Restless and looking for adventure, Gates (George Clooney), Barlow (Mark Wahlberg), Elgin (Ice Cube) and Vig (Spike Jonze) stumble on a map revealing the location of hidden gold bullion that the Iraqi Army stole from Kuwait. Setting out on their own, the four soldiers plot a quick smash and grab operation to locate, seize and keep the gold for themselves. Nothing goes as planned and they are soon embroiled in the middle of the Iraqi civil war that broke out in the shadow of the US military action: rebel forces are trying to oust the government of Saddam Hussein; the revolutionary guards are brutally suppressing the uprising; and the gold-seeking American soldiers are caught in the middle, AWOL with no back-up and no orders to interfere in the unfolding drama. Barlow is taken prisoner, Gates connects with the rebels, and soon what was a treasure hunt turns into an international incident, with three surviving American soldiers choosing a side in the internal Iraqi conflict, against the orders of their government and commanders. Hollywood re-imaginings of wars to correct the wrongs of history are common, and here director David O. Russell, filming his own script, goes back to the first war with Iraq to correct the travesty of the United States encouraging the overthrow of Hussein after the liberation of Kuwait, and then leaving the rebels to get slaughtered by the helicopters of the brutal regime. In Three Kings, Gates and his three co-conspirators refuse to abandon the rebels and their families, and pay a high price in lives and treasure lost in order to uphold the principle of loyalty. 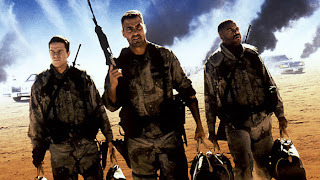 Three Kings is also a strong anti-war statement, with Russell humanizing Iraqi rank-and-file soldiers, demonstrating their suffering and family losses as victims of American aerial bombing. In story, style and comic elements, Three Kings borrows heavily from Clint Eastwood's Kelly's Heroes (1970), the fictional World War Two adventure also about a small group of soldiers attempting to steal gold and triggering much bigger events. Russell directs with an entertaining irreverence that captures the absurdity of war, and allows stars Clooney and Wahlberg to shine brighter than the stark desert sun. Three Kings delivers its message with an eccentric and sometimes uneven combination of bluntness and humour: even the greediest and most jaded soldiers can see their way to doing the right thing. Perhaps it takes being there, near the battle, to distinguish right from wrong, and that's why the political puppet masters invariably get it wrong.